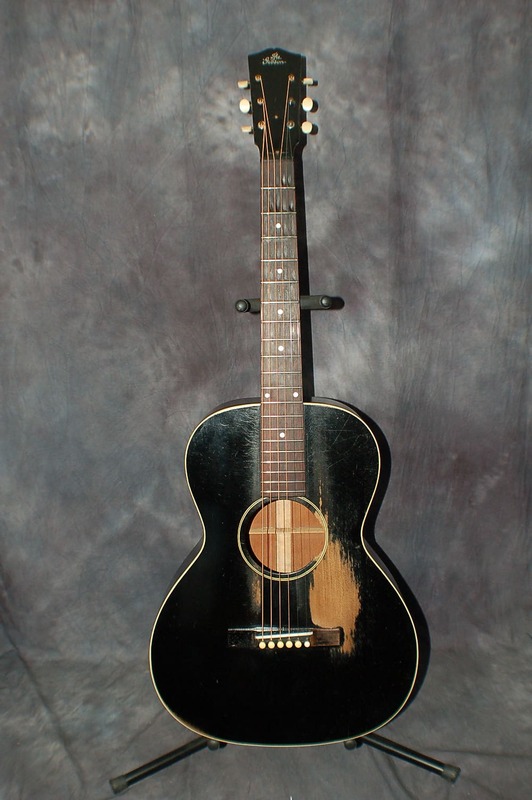 Does anyone own a vintage Gibson L-00 (Black) from the 1930's? I listened to a sound clip from this model and was blown away by its voice. Just curious if there are any proud owners of this model. I would love to hear your opinions for this model against the re-issues. I am really keen on getting one but am however not sure where to look. Here's your deals, Sam. Pony up brother. PPal gives you six months interest free. While the color wouldn't effect the tone, I understand why the black finish is cool. You'll have to hunt and be patient for the true black w/white P'guard. I helped a friend sell a mid-thirties beauty a couple years back, that was a well kept under the bed case queen. It sold for just under 6K. I have heard of an occasional complaint about 'dull' sounding L00/L0's, but I've played a few from the 30's and 40's, and never been disappointed. Super light weight and hefty neck are right up my alley. There are members here who play newer copies, so they'll probably chime in, but I'm a fool for old wood. Owned one in the early 1990's. Fine sounding guitar w/more lively response than many L-00's of the same vintage. Extremely light in weight/fine neck if, like me, you feel more comfortable with a ball bat than with a broom handle. Sure wish I still had it! Very cool looking L-00 there but yes I have been leaning toward the true black. Its kind of exciting as I have decided for the L-00 to be my first vintage guitar, and purchasing for the first time, sight unseen and all. If possible, I might want to get my hands on the 12 fret construction which is the 1932 (or earlier years)? Subsequently they came in 14 frets, but I figure 12 fret gives more of an edge to fingerpicking. Then again I can hit more frets with the 14 fret construction. Maybe I will leave it to fate and see which make turns up. Good luck. They're out there, but getting rarer. Ask folks here to keep an eye out for you and DM if they have a lead. I'm always window shopping, so I'll put you down on my trusty desk blotter. For the tone and looks this sure feels like a keeper if nothing else. Thanks Dave! I am checking on its availability. Fingers crossed! Side note, I have seen other pieces go on Reverb for around 2000 to 3000 while some are 4000 to 5000. Is there an estimate on its market value at present moment? Value floats with condition, Sam. I've tracked many L00/L0's, and find nearly all sellers know their stuff, so ballpark estimates run the spectrum. Repairs like neck resets, fingerboard planing/fretjobs, and other structural issues have to be investigated and asked about in detail, so you aren't surprised when you open the box. Look at the highest/best condition piece, and the so-called beater. That's the estimate range right there. I see a fret board re-surfacing on the horizon with Dave F's suggestion. Remember, you're keyed into a special version of the model, so your search is narrowed, and perhaps going to be more costly. I was on the hunt for one a couple years back and couldn't find one in my budget the did it for me. I auditioned a 12 fretter that was reasonable but I run out of real estate on a 12. I should mention I tried a Kalamazoo KG14 that had been converted to x braced and it was incredible and at 2-3k less than a 00. Yeah not quite the cool factor of the 00 but it was stellar. The Kalamazoos are worth a look. Good luck as Mr. Zep said they are out there but fading fast (at least in my budget). Good luck in your hunt. P.S. I have played some of the newer ones, and although good, just don't quite get there for me. While you're hunting, it may be worth your time to look at the newer small bodies even though most don't think they can capture that old wood sound. I wish I had the opportunity to try out some of the newer torrefied tops but I haven't. I haven't had many opportunities to play a vintage against a modern version plus I don't think I have a good enough ear to properly analyze them. I defer that to a couple friends whom opinions I value. Currently I have a vintage J45, a Legend J45 which is supposed to be as close as you can get to a real vintage based on Eldon Whitford's 1942 and a Kris Kristofferson SJ bases on his '50's SJ. Three guitars that have the same DNA. There's a '43 LG1 getting some TLC. When it get's back, I'll compare it to the RI that was based on John Thomas' LG1. Here's a few modern small bodies you may want to check out. I have two L-00 sound clips to share. One is a Greven L-00 and the other is a Vintage 1937 L-00. The Vintage has the 'old and woody' tone of course not sure if the Greven would sound that way after god knows how many years, although I must say the Greven really has the vibe of the vintage? Almost as if it was how the Vintage sounded when brand new? Its weird to think how the Vintage L-00 sounded when it was brand new all those decades ago. Nicely done, jt! Thanks for sharing that. Nice clean playing jt! Enjoyed that Immensely.